Fashion brand Donna Karan New York has introduced its new face for Spring collection 2015. It is a supermodel Andreea Diaconu. She is 23 years old and comes from Romania. She poses in a beautiful gown in front of picture painted by brush strokes for great German photographer Peter Lindbergh. Andreea is very popular in her country and starting to be well-known abroad also. She was the model of runways of Balmain, Nina Ricci, Mugler and Isabel Marant. Donna Karan New York has revealed its new face for Spring collection 2015. 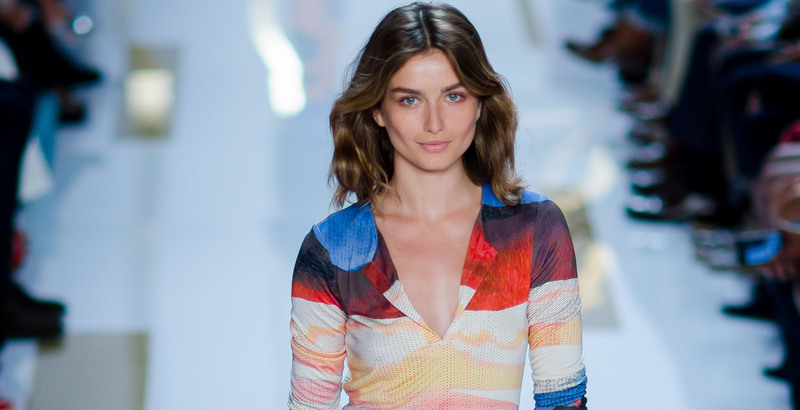 Romanian 23-year-old supermodel names Andreea Diaconu. She poses in a beautiful printed fabric gown against coloured picture made by brush strokes. She was captured by great German photographer Peter Lindbergh. Andreea is very popular in her native country and starting to be well-known abroad. She having posted in campaigns for prestigious brand like Tiffany & Co., De Beers and Chloé. She walked the runways of Balmain, Nina Ricci, Mugler and Isabel Marant.